installation size of packages that are in cloud and container images. Such attempts usually rely on using repoquery or just human estimation. While those techniques can suffice, I think in the long term we need to have tool that helps to at least partially automate this effort. The main reason for that is to prevent regressions by continuously monitoring the installation size. INSIM (INstallation SIze Monitor) is a tool that monitors installation sizes of given packages over the time for multiple releases of Fedora. It can compare dependency graph of given package at any two points in history. Let's take a look at a concrete example. I'm a maintainer of freemind package and although freemind is not in any cloud image, I'm getting complaints from users that it's pulling in hundreds of MBs, while upstream size is way smaller. Let's take a look how INSIM can help me in this case.The basic view can show you the installation size comparison graphs across multiple Fedora releases. We can clearly see that although I tried to reduce the depenency size in Fedora 23, there has been a regression in size in Fedora 24. 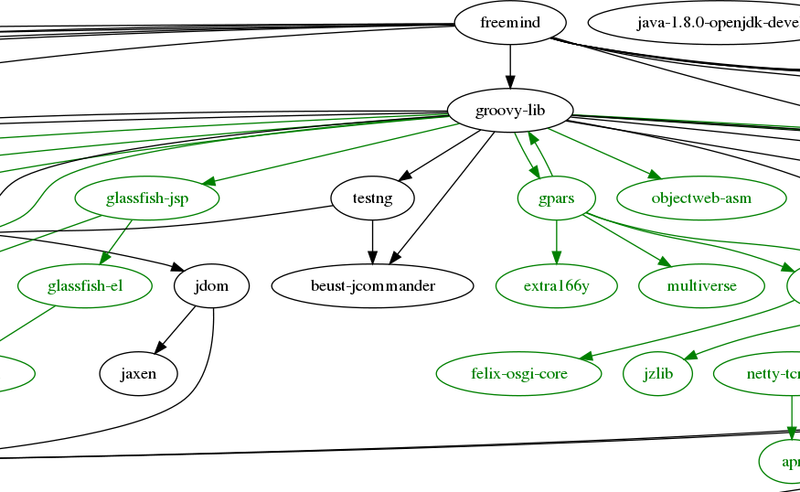 I haven't updated freemind itself, so the change has to be somewhere deeper in the dependency graph. 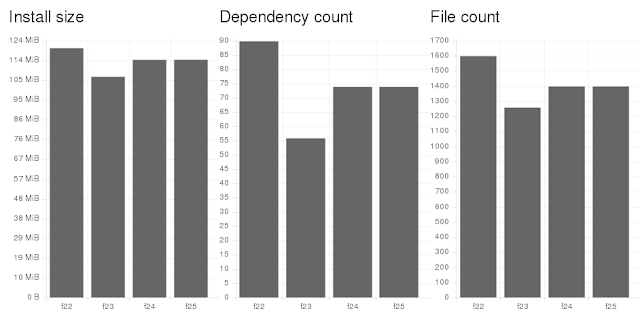 INSIM then shows graphs showing dependency size changes within particular Fedora releases. By clicking on a particular point on the graph's line, you can select it for displaying dependency details at particular time, or select it for comparison. After you select it for comparison, you can select another point, possibly in a graph for different release, to do the comparison against. In case of freemind, I'll select points on Fedora 23 and Fedora 24 graphs. Insim will display the changes in dependencies in multiple forms - as a list, and as a graph. Since I'm comparing across two releases, the graph form is more useful. There you can clearly see which package is to blame for the regression in installation size - groovy-lib. Therefore I was able to identify the reason for size increase within few seconds. how it works. The main entity tracked by INSIM is called a module. Module is a set of packages to be monitored. In most cases, it will contain just the single package - the one the maintainer is interested in - but it can be a whole package group. A module can be based on another module which is used as a baseline in comparisons. In the previous example the baseline for freemind was java - the java-1.8.0-openjdk package. The dependencies pulled in by the base are not included in the graphs and calculations. INSIM periodically processes Fedora repos to resolve dependencies of packages using libsolv/hawkey library. Therefore the resolution algorithm is the same as with dnf. The dependency difference calculations are then done on demand. The production instance is available at http://insim.fedorainfracloud.org/insim/. The current version is not self service yet - if you want to add you own module there, you need to ping INSIM maintainer, Mikolaj Izdebski (mizdebsk@redhat.com, mizdebsk on #fedora-devel). Last week I've been working on improving the LVM plugin thinpool sharing capabilities. I didn't explain LVM thin-provisioning before, so I'll do it now to rationalize what I'm doing. With classical volumes you have a volume with given size and it always occupies the whole space that was given to it at the time of creation, which means that when you have more volumes, you usually can't use the space very efficiently because some of the volumes aren't used up to the capacity whereas others are full. Resizing them is a costly and risky operation. With LVM thin-provisioning there's one volume called thinpool, which provides space to thin volumes that are created within. The thin volumes take only as much space as they need and they don't have physical size limit (unless you set virtual size limit). That means that if the space is not used by one volume it can be used by another. Previously there was one thinpool per configuration which corresponded to one buildroot. It could have snapshots, but there was still one buildroot that could be used at the moment. Now you can use mock's unique-ext mechanism to spawn more buildroots from single config. Unique-ext was there even before I started making changes, but now I implemented proper support for it in the LVM plugin. It's a feature that was designed mostly for buildsystems, but I think it can also be very useful for regular users who want to have more builds running at the same time. With LVM plugin the thinpool and all the snapshots are shared between the unique-exts, which means you can have multiple builds sharing the same cache and each one can be based on different snapshot. The naming scheme had to be changed to have multiple working volumes where the builds are executed. Mock implements locking of the initial volume creation, so if you launch two builds from the same config and there wasn't any snapshot before, only one of the processes will create the initial snapshot with base packages. The other process will block for that time, because otherwise you'll end up with two identical snapshots and that would be a waste of resources. Other sharing mechanism that is now implemented is sharing the thinpool among independent configs. Then the snapshots aren't shared because the configs can be entirely different (for example different versions of Fedora), but you can have only one big logical volume (the thinpool) for all mock related stuff, which can save a lot of space for people that often use many different configs. You can set it with config_opts['pool_name'] = 'my-pool' and then all the configs with pool_name set to the same name will share the same thinpool. Other than that I was mostly fixing bugs and communicating with upstream. This week I've been on Flock and it has been amazing. There were some talks that are relevant for mock, most notably State of Copr build service, which will probably use some of the new features of mock in the future and Env&Stacks WG plans, which also mentioned mock improvements as one of their areas of interest. LVM plugin was moved to separate subpackage and conditionaly disabled on RHEL 6, since it requires lvm2-python-libs and newer kernel and glibc (for setns). One of the things that I needed to sacrifice when I was making the LVM plugin was the IPC namespace unsharing, which mock uses for a long time. The problem was that lvcreate and other commands deadlocked on unitialized semaphore in the new namespace, so I temporarily disabled it and hoped I'll find a solution later. And I did, I wrapped all functions that manipulate LVM in function that calls setns to get back to global IPC namespace and after the command is done, it call setns again to get back to mock's IPC namespace. One of the other problems I encountered is Python's (2.7) handling of SIGPIPE signal. It sets it to ignored and doesn't set it back to default when it executes a new process, so a shell launched from Python 2 (by Popen, or execve) doesn't always behave the same as regular shell. For cat it's just an example and it didn't make much difference. But if you put tee between the cat and head, it will loop indefinitely instead of exiting after first 5 bytes. And there are lots of scripts out there relying on the standard behavior. It actually bit me in one of my other programs, so I thought it's worth sharing and I also fixed it in mock. I've setup a new branch, rebased it on top of current upstream and tried to revisit all my code and get rid of changes that were reverted/superseded, or are not appropriate for merging yet. I squashed fixup commits to their originl counterparts to reduce the number of commits and changed lines. C nofsync library, because Mikolaj made a more robust nosync library that is packaged separately, and therefore supersedes the bundled one. That way mock can stay noarch, which gets rid of lots of packaging issues. And also saves me a lot problems with autoconf/automake. There is no support for it yet, because I need to figure out how to make it work correctly in multilib environment. Everything else was submitted including the LVM plugin. The merging branch is not pushed on github because I frequently need to make changes by interactive rebasing and force pushing the branch each time kind of defeats the purpose of SCM. Other than that I was mostly fixing bugs, the only new features are the possibility of specifying additional commandline options to rpmbuild, such as --rpmfcdebug with --rpmbuild-opts option and ability to override command executable paths for rpm, rpmbuild, yum, yum-builddep and dnf, in order to be able to use different version of the tools than the system-wide version. Hi again, I'm sorry I didn't post last week, because I've been on a vacation. rpmbuild has an option --short-circuit that skips stages of build preceding the specified one. It doesn't build a complete RPM package, but it's very handy for debugging builds that fail, especially in the install section. But this option is not accessible from within mock and I already mentioned in my proposal that I want to make it available. The option is also called --short-circuit and it accepts an argument - either build, install, or binary, representing the build phase that will be the first while the preceding phases would be skipped. For Yum or DNF some of the options that are often used when user invokes the package manager directly also weren't available in mock. --enablerepo and --disablerepo are very common ones and now they are also supported by mock - they're directly passed to the underlying package manager. The repos of course have to be present in the yum.conf in mock config. I started working on porting mock to Python 3. This doesn't mean that mock will run on Python 3 only, I'm trying to preserve compatibility with Python 2.6 without the need to have two version of mock for each. I changed the trace_decorator to use regular Python decorators instead of peak.utils.decorate and dropped dependency on the decoratortools package. There are slight changes in traceLog's output, that I don't consider important, but if someone did, it could be solved by using python-decorator package, which is available for both versions. There are some features that are still untested, but the regularly used functionality is already working. Rebuilding RPMs, SRPMs, working in shell, manipulating packages is tested. The plugins, that are enabled by default (yum-cache, root-cache, ccache, selinux) also work. What doesn't work is the LVM plugin, because it uses lvm2-python-libs, which doesn't have a Python 3 version yet. Same applies to mockchain, which uses urlgrabber. To try mock with Python 3, either change your system default Python implementation or manually hardcode python3 as the interpreter to the shebang in /usr/sbin/xmock.